The interior decorating industry is constantly evolving and being informed by new ideas. The focus on wall art continues to grow from strength to strength, and the value of displaying artwork on walls is being recognise by designers, builders, and decorators in all types of homes. Creating prints to hang on the walls of your home is a great way to introduce colour, vibrancy, and a personal touch. Canvas has typically been a popular but traditional choice for wall prints, however it’s also one of the cheapest and less durable options. Canvas prints are at risk of fading – especially if exposed to direct sunlight – and their mounting points can also rust and damage prints over time. The nature of canvas printing and the texture of canvas means that when transferred, the vibrancy of a print can be lost. A relatively new technology that’s coming to replace canvas art is glass photo printing. This method has a number of advantages that make it a better option over canvas in many ways. Here are just some of the reasons why glass photo printing is increasing in popularity amongst interior decorators and home designers. There’s a significant difference in the amount of vibrancy that can be achieved when printing on glass over canvas. Glass allows for the full transfer of colour, and its glossy finish adds to the pop of colour that’s immediately noticeable when entering a room. Canvas, on the other hand, is more subdued as it has a dull and more rustic finish. Glass prints are easy to wipe free of dust and any stains that may have happened to have found their way onto the print. A wet cloth is usually all it takes to keep the print looking clean, although a glass surface cleaner like the DecoGlaze All Surface Cleaner will establish a better, more polished look for longer. The same cannot be said for canvas, which will absorb stains and is not suitable for cleaning with water. Due to its ability to resist water, a glass print is the perfect way to introduce some art into rooms that often experience moisture. Whether this may be a bathroom, laundry, outdoor space or sauna, glass prints are suitable for humid and moist areas. On the other hand, canvas is not able to withstand these conditions and will lose its quality. Glass photo prints are perfect for use in spaces that may lack natural light, as their translucent properties create a feeling of vibrancy and light. They’re a perfect way to brighten up a room, while their canvas counterparts will always display a grainier look. Interior designers and decorators are massive advocates of using different textures to add impact to any space. Glass photo prints are a great way to add a different texture to a room, especially when mounted against a traditional wall. Where canvas has a grainy texture similar to that of a plaster wall, glass can add a sharp, modern, and smooth texture to a room. Glass is completely resistant to moisture, and it’s also protected from UV. Canvas, on the other hand, must be kept dry and will suffer fading if exposed to sunlight. Glass is also easier to clean, which means your print has the potential to last a significantly longer amount of time. Fundamentally, glass prints are a more modern take on traditional wall art tapestries and pieces. They add a level of sophistication and sharpness to a room, and this is why they are favoured by contemporary designers. With so many advantages to the use of glass photo prints, perhaps the only important decision is what to have printed. 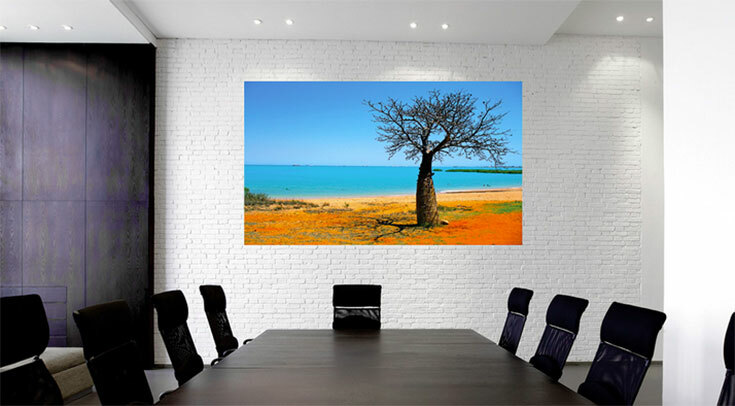 Your chosen design is the most important variable when determining the success of a glass photo print and the resulting look and feel of a room. Firstly, a print should match the colour scheme of your room to some extent, and should not clash your decor but rather complement it and lift the ambience of the room. Secondly, the theme of your print and room should work together. For example, an oriental inspired room will not work well with a nautical print. This can create a confused ambience, so remember to make sure your print and room theme are related in some way. Next, the size of your print is an important consideration, as mounting a large print on a small wall can cause the room to feel smaller. The opposite can also be true, with a small print looking odd and out of place on a large wall. Some people like to create their own prints using family photos, or perhaps photos they have taken when travelling. This is a great way to add a personal touch to any space or give additional meaning that others may or may not know. Wall art is a personal choice, and glass photo printing provides the versatility to create almost anything that you like that will match the design of your room and rest of your home. No matter what design you choose, a glass print is sure to add some impact to any wall.